Donita Escott was born on March 22, 1925 in Ottawa, KS to Alva E and Grace Mary Savidge Reneau. The family moved to Kansas City when she was a child and was in school there until the third grade. At age 8 her parents divorced. After her mother remarried,they moved to Osawatomie where she completed school, graduating in 1942. She moved to Kansas City shortly after graduation where she became a charter member of the Gamma Delta Chapter Beta Sigma Phi Sorority. 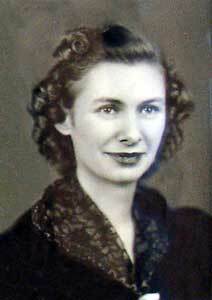 Her first employer was the First National Bank from 1942 - 1943. From 1943 - 1946, she went to work for Cassidy Commission Company in the Kansas City Livestock Exchange Building. From 1951 - 1960, she worked at City Hall in Kansas City, MO. From 1963 - 1967 she worked at Commerce Bank in Kansas City. Her last employer was the Osawatomie State Hospital from 1974 - 1987 where she received acknowledgements for her dedication. Mrs. Escott met her future husband, Joseph M Escott, Jr. while they were both employed at the Livestock Exchange Building. They were married August 16, 1946 and became parents to four children. They made their home in both Kansas City, MO and Kansas City, Kansas before moving to Osawatomie in 1971, where she remained until her death. She had an indomitable spirit, a strength from within, that kept her going for almost 94 years. She was admired by her community and loved by her family. She will be missed by all and never forgotten. Michele Stewart, Kansas City, KS, Becky Townsend, Kansas City, KS and Jay Escott, Bluffton, SC. Nine grandchildren and eight greatgrandchildren. Service: Noon Thursday March 7, 2019 all at the Eddy-Birchard Funeral Home.